Richard O’Donovan looks pleased to make par on the eighth in the final round. 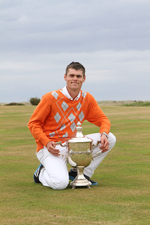 (Credit Jenny Matthews www.newsfile.ie)Not only was his two under par total of 286 good enough to win, he won by two strokes from Limerick’s Pat Murray, Co Louth’s Gareth Bohill and Ballymena’s 17-year old Walker Cup prospect Dermot McElroy. In fact, his comeback was so stunning - he was nine under for the last 27 holes - that he could have been forgiven for thinking he had overslept his tee time and was still snoozing away under the eaves of the famous old clubhouse. “Awestruck, it feels unbelievable,” said a shocked O’Donovan, after an anxious wait of more than two hours to see if anyone could match his total. Richard O’Donovan hits to his final green, the ninth, en route to his East of Ireland victory. (Credit Jenny Matthews www.newsfile.ie)As he signed his card, the leaders were heading down the back nine and the wind was rising. And one by one the fell away, leaving him clutching the trophy and a place in the history books alongside amateur giants such as Garth McGimpsey or Joe Carr. To the winner, the spoils. (Credit Jenny Matthews www.newsfile.ie)“Words can’t express how I feel,” he said. “I actually don’t know. It just feels weird. I only made the cut and I am the winner. You just have to laugh at it. One flawless round did it. Last year’s Leinster Youths champion and a Boys international in 2008, O’Donovan has dedicated himself to the game full time since he left school, spending the last two winters working with a host of youngsters, many of them Irish, at the TSA Golf Academy in Spain. His ambition this season was “to win a championship and to get on as many teams as possible” but that looked like a pipe dream after the lost in the second round of the West, missed the cut on countback in the Irish Amateur Open and then pulled out of the “Close” with a neck injury after shooting 82 in the opening round. O’Donovan hits his second to the 8th hole in the final round. Click to enlarge. (Credit Jenny Matthews www.newsfile.ie)All of a sudden he’s a “major” winner and a serious candidate for a place in the Irish team that will host the Home International Matches at County Sligo in August. The neck injury cleared up “95 percent” and it showed as he bombed long drive after long drive with a new TaylorMade Burner TP - “It goes miles” - and a putter that was only marginally cooler than the surface of the sun. It was certainly hotter than his start to his third roud on a bright, sunny morning as he double bogeyed the opening hole to slip 11 shots off the pace before he dug deep and somehow managed to play the back nine in three under par for a 71. Despite all that he was still seven adrift of 54 hole leader Gareth Bohill, who was bidding to become the first home winner of the title for 26 years after a third round 70 left him a shot clear of McElroy on three under par. Armed with his new driver, last year’s Leinster Youths champion set off on the back nine like a man possessed and pummeled the fast-running links, and the rest of the field, into submission. Forced to chip from the putting surface and then hole a seven footer for par at the 10th, he birdied the 11th from seven feet before recording a purple patch of five successive threes that brought him birdies at the 13th (20 feet), 14th (12 ft) and 16th (18 ft). He then holed a seven footer for another birdie at the par-five 18th - his only birdie four in his final round - to turn in five under par 30. His magical run didn’t register over the walkie talkies until he picked up his sixth birdie of the round with a 15 footer at the fourth to surge into a share of the lead on two under par with Murray, who was about to turn for home. Just four shots off the pace entering yesterday’s 36-hole finale, the 39-year old Tipperary native looked to have blown his chances of victory with a third round 75 that left him six shots behind Bohill. But just minutes before O’Donovan set the target at two under par, Murray went out in five under par 32 as he eagled the second, birdied the third and fourth and then followed a regulation bogey at the fifth with birdies at the sixth and ninth. 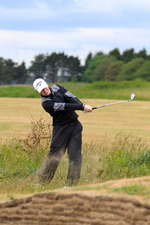 Ballymena’s Dermot McElroy plays from the rough on the third hole in the final round. (Credit Jenny Matthews www.newsfile.ie)Tied for the lead with O’Donovan on two under with nine to play, a senior amateur major beckoned for Murray. But as the wind freshened and the temperature dropped, the Munster veteran couldn’t get over the line. After beginning the back nine with five straight pars, the title slipped from his grasp when he missed a three footer for par at the 15th, three putting from the front of the green there to fall one behind. Pat Murray (Limerick) on the final day of the East of Ireland Amateur Open Championship at Co.Louth Golf Club. (Credit Jenny Matthews www.newsfile.ie)There was still time to at least force a play-off but after saving a miraculous par at the 16th, Murray bunkered his tee shot left of the 17th, recovered weakly to 15 feet and dropped a crucial shot to fall two adrift. Now needing an eagle at the 559 yard finishing hole to force a three-hole play-off, a steadt south wind made that impossible and he failed to hole out from 70 yards short of the green for the necessary three. But after starting the back nine with five straight pars to remain tied for the lead, the veteran Munster man three putted from the front of the 15th for bogey to fall one behind. Needing to play the last three holes in one under par to force a play-off, his title challenge ended when he bunkered his approach left of the 17th, splashed out weakly to 15 feet and failed to get up and down for his par. Pat Murray’s title challenge ended in the bunker left of the 17th. (Credit Jenny Matthews www.newsfile.ie)He now needed an eagle at the 559-yard last to force a three-hole play-off but the stiff south wind made it impossible to make the green in two.